Peggy Doering wants you to know that the Valley isn't just highways, concrete and subdivisions. "When you get out here, we have safe places to ride and you are with nature," says Doering. "You are in God's world out here. It's beautiful." The Spokane Valley Cycle Celebration offers serious cyclists (or those just wanting to get more comfortable riding a bike) the opportunity to explore the semi-rural areas surrounding Spokane Valley as part of a safe, supported event. Held July 31 as part of Valleyfest (Doering is the executive director), Cycle Celebration offers 10-mile, 25-mile and 50-mile marked routes. Doering says that comfort stations are set up along each route, where riders can recharge with water and snacks. Each ride starts at Mirabeau Park Meadows. The 10-mile course heads east on the Centennial Trail, and Doering says that this ride might be good for someone new to cycling or who wants to bring their kids along. The 25-mile ride goes to the Saltese Uplands trailhead. The 50-mile ride is the most strenuous; Doering says it takes riders through rolling hills and prairie while providing them with views of both Mica Peak and Mt. Spokane before finishing at Liberty Lake. Registration costs $20 for adults and comes with a cycling T-shirt. Each of the routes will be swept of debris, and volunteers will be on hand to make sure no one gets lost or left behind. Back at Mirabeau Point Park, there will be a bike rodeo, a taco truck, live music and candy for the kids. At the end of the event, Doering hopes that participants have a better appreciation of cycling in the Valley. "We have a lot of bike lanes that are built into our street structure, and we want people to enjoy what we have," she says. The Hiawatha Bike Trail runs along a former train track and connects Idaho and Montana. Columbia Plateau State Park Trail is a 4,109-acre park that stretches 130 miles from the Fish Lake Trailhead outside of Cheney all the way to Pasco. The trail is built along the route of a railway where trains once chugged through Eastern Washington. Now, it's a way to check out places such as the Turnbull National Wildlife Refuge, as well as some of Eastern Washington's more underappreciated and remote landscapes. It's also a good way to watch wildlife such as deer, elk, moose and 200 species of birds, while also catching an up-close look how the Missoula Floods shaped the region thousands of years ago. There are 48 miles of developed bike routes along the trail, so if you're planning on going on a longer ride, bring your mountain bike or get some more rugged tires. Because it was a train track, bring along a bike light so you can find your way in the tunnels. For a casual day trip, there's a 15-mile bike route near Ice Harbor Dam that runs alongside the Snake River. If you're more into mountains, then head east for the Route of the Hiawatha Bike Trail. It's a 15-mile bike route connecting Idaho and Montana that also runs along a train track and provides rare views of the heavily wooded area from its trestles. If you don't have a bike, you can rent one. If you're bringing your own, a mountain bike is definitely preferable, but a sturdy road bike with studded tires will work fine. Also be sure to bring a jacket and front bike light for the chilly and dark tunnels you'll be traveling through. If you want to make a night or weekend of it, the area is next to the Lolo National Forest, and there are primitive campsites along Loop Creek and the North Fork of the St. Joe River. If you're looking for something a little more upscale, there's the North Fork Campground, Turner Flat Campground, Campground St. Regis or Tin Can Flat Campground that are all more groomed and have amenities, but charge fees. There are also hotels in nearby Mullan and Wallace. If you are an enthusiast of both lentils and bikes, the Tour de Lentil Bike Ride, held in conjunction with the National Lentil Festival in Pullman on Aug. 20, should be on your to-do list this summer. The length of the ride (not race) ranges from 50 kilometers (31 miles), 100 kilometers (62 miles), or 150 kilometers (93 miles) and takes riders through the wave-like landscape of the Palouse. If you're looking for something a bit more casual, the Bill Chipman Palouse Trail is an abandoned railway that's been turned into a 7-mile bike and pedestrian path connecting Pullman with Moscow through rolling fields of wheat. If you're coming from Pullman and feeling ambitious, take the Latah Trail from Moscow another 11 miles farther to Troy. Have you ever wondered what it would be like if cars suddenly vanished from the streets, opening them up to bikes, pedestrians and other human-powered means of transportation? Well, it's happening June 21 from 6-9 pm, as part of the Spokane Summer Parkways. During these hours, a loop of city streets connecting Manito Park to Comstock Park will be cut off entirely from cars, allowing people to leisurely pedal or stroll through them without having to worry about traffic. Summer is a time for bike riding. It's also a time for bike stealing. If you're smart, now is the time for bike registering. 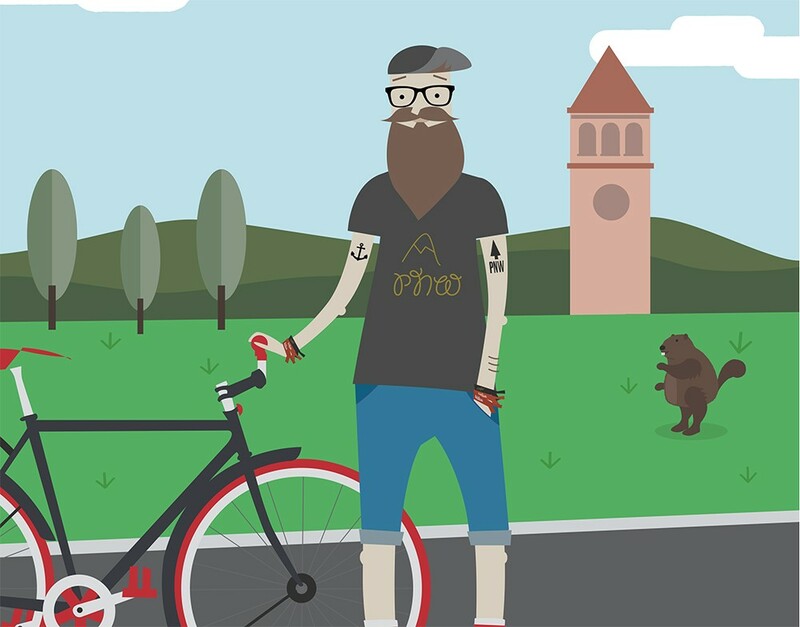 Last year, the city of Spokane developed SpokaneBikeID.org as a way to reunite stolen bicycles with their owners. Spokane police routinely recover lost or stolen bikes, but have no way of finding their rightful owners. With the registry, users enter their contact information as well as the serial number and description of their bike, so police can return it should it go missing. If you don't have access to the internet, drop by your local Spokane C.O.P.S. shop. Let's be honest: Riding bikes can be kind of a boys' club, right? That's not the case at Princess Pedalfest, where participants can "Ride like a Princess, Conquer Like a Queen," according to the event's slogan. The noncompetitive women's bike ride will be held Aug. 6 in Hayden, Idaho. There are three different rides, of 25, 45 and 60 miles. Along each ride are "motivation stations" with snacks and beverages. Each participant gets a T-shirt, swag bag and catered lunch. Get details at princesspedalfest.com. If you like social bike rides after work, North Idaho is a good place to be. If you don't want to huff and puff to keep up with the leader of the pack, there are several "no drop" bike rides that take place each week. On Tuesdays, one group meets up at 6 pm at Coeur d'Alene Bike Co. on 314 N. Third St. The group usually rides for about an hour or so before concluding at a pub or eatery for a well-deserved pint. Road bikes are encouraged for the Tuesday ride, but if mountain biking is more your thing, there's a similar ride that starts each Wednesday at 6:15 pm at the Nettleton Gulch parking area. If you can't make Tuesdays, there's another group that meets up at 6:30 pm on Thursday at the same location. If you're looking for a more spirited pace, a group meets up at 6 pm on Tuesdays behind Vertical Earth at 1323 East Sherman Ave. to ride a mountain bike course. On Mondays, a women-only group meets up at the shop at 6 pm. On June 21, the sun will hang in the sky longer than it will any other day of the year. 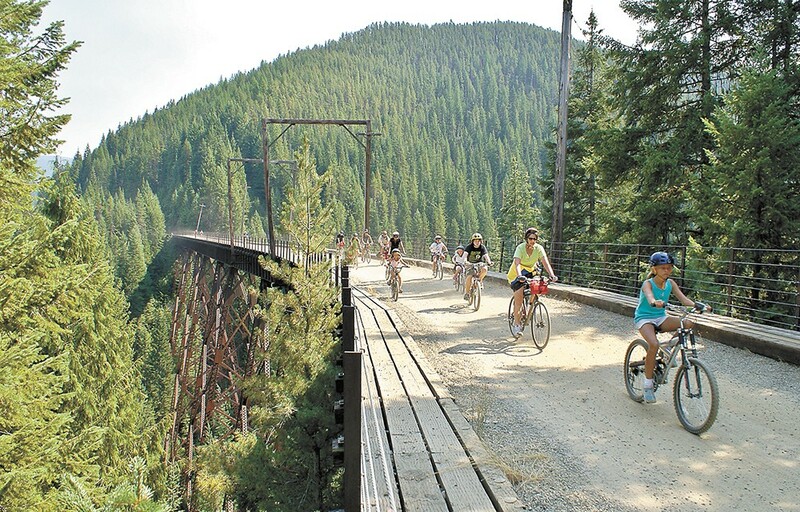 So why not enjoy the longest day with a 13-mile ride through North Idaho? The Ride the Wall event is a 13-mile bike course that follows the Trail of the Coeur d'Alenes from the Snake Pit to Cataldo before turning onto the CCC-Wall Ridge route and finishing with some barbecue. The $35 registration will benefit the Fuller Center for Housing, a nonprofit that builds and renovates housing for the needy.